The Teenage Mutant Ninja Turtles are truly legendary. From TV shows to blockbuster hit movies, toys, video games, apparel and more, the Teenage Mutant Ninja Turtles have made an incredible impact on all of us in so many ways. We can’t wait for Nickelodeon’s brand new, animated series, Rise of the Teenage Mutant Ninja Turtles, which is set to premiere on the network later this year. 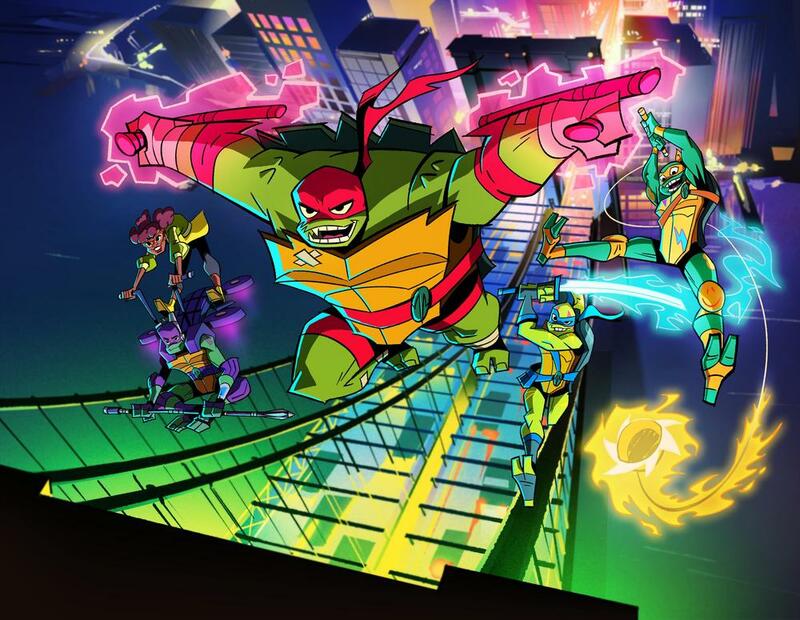 The phenomenal and much-anticipated show focuses on the four, renowned turtles: Raphael, Michelangelo, Leonardo, and Donatello with their trusty, tech-savvy ally, April O’Neil and their adventures and fun in the mystical world beneath the streets of New York City. Just recently, Nickelodeon revealed a first look at the characters of Rise of the Teenage Mutant Ninja Turtles. With a brand new look, we can already tell that this series will be absolutely remarkable and something that will have us glued to our TV screens. The characters’ looks were unveiled via a Facebook live. According to the press release, “Rise of the Teenage Mutant Ninja Turtles reimagines the characters in a fresh new way, featuring jagged-shelled Raphael as a snapping turtle, wielding twin tonfas as his weapons; Leonardo as a red-eared slider, using an ōdachi sword; Donatello as a soft-shell turtle, sporting a tech-bo staff; and Michelangelo as a box turtle, arming himself with a kusari-fundo. Along for the adventure is the Turtles’ most trusted ally, April O’Neil, a street savvy native New Yorker and Splinter, father figure and sensei to the Turtles. #ICYMI (In case you missed it) – check out the Facebook live revealing the characters of Rise of the Teenage Mutant Ninja Turtles below! Be sure to follow @Nickelodeon and @TMNT on all social media networks to keep up with the magnificent, new show. Previous Article: Bon Jovi Set To Perform And Be Honored At The 2018 iHeartRadio Music Awards Plus Camila Cabello And Chance The Rapper To Be Awarded At The Event! Next Article: The Multi-talented Tiffany Haddish Set To Host The 2018 MTV Movie & TV Awards!